This revealing new monitor provides a surprising degree of low-end punch given its size. 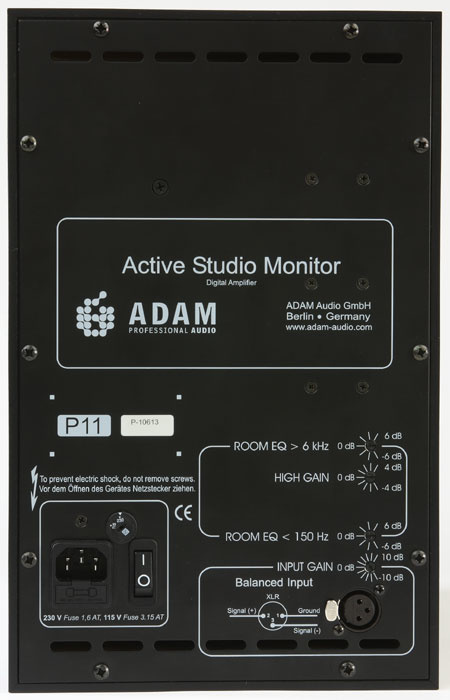 ADAM build a whole range of speakers ranging from desktop systems to full-scale studio monitors, but one thing they all have in common is ADAM's ART (Accelerated Ribbon Technology) ribbon tweeter. The design comprises a metalised lamella ribbon diaphragm folded rather like a concertina bellows. In contrast with flat ribbons and moving-coil tweeters, all of which exhibit more or less pistonic behaviour, the ART tweeter achieves four times as much air movement for a given movement of the driving diaphragm, providing high sound pressure levels with very low distortion and an upper frequency limit in excess of 30kHz. The P11As come towards the small end of the ADAM range, but still offer full-range performance at a high enough SPL to meet the requirements of most desktop and nearfield applications. Based on the familiar two-way front-ported arrangement, the P11A measures just 210 x 330 x 280mm (similar in size to the smaller Mackie HR624s) and houses a 182mm woofer built specially for ADAM utilising a Nomex cone powered by a 33mm voice-coil. Protected by a slotted steel grille, the ART tweeter has a ribbon surface area of 71 square centimetres, while occupying just 9.5 square centimetres of space. Each driver is powered by its own amplifier rated at 100W (150W peak), with an active crossover operating at 1.8kHz. ADAM have included the distinctive chamfered baffle corners used in some of their larger designs, which help to reduce cabinet edge diffraction. The main enclosure is fashioned from MDF laminated with black plastic, and the thick MDF front baffle is painted a satin black colour. Both the tweeter and woofer are recessed flush into the baffle and secured using cross-head bolts, and a green LED shows when the speakers are active. Despite their compact size, the speakers weight a confidence-inspiring 10kg each and boast a frequency response of 48Hz-35kHz (±3dB). With a maximum SPL of 107dB, the speakers put out enough level for comfortable listening at short range and are compact enough to fit on most monitor shelves or speaker stands. Photo: Mike CameronOn the rear panel are an IEC mains inlet and power switch plus a balanced XLR signal input connector. Personally I like to have a choice of XLR or balanced jack, but this is a small detail. Four screwdriver-adjustable trimmers enable the user to change the input sensitivity over a ±10dB range and also to adjust the tonal balance of the speaker to meet personal preferences and to help compensate for positioning within the room. To these ends, the tweeter level may be adjusted independently of the woofer by ±4dB, while two shelving filters set at 150Hz and 6kHz provide an adjustment range of ±6dB each. 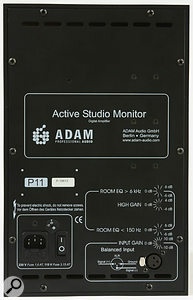 The low adjustment is particularly useful when locating the speakers close to walls or corners, as this always has an effect on the levels of low frequencies projected into the room. ADAM recommend that the speakers be placed no closer than 40cm to walls where possible, and they should ideally be used vertically (with the tweeter above the woofer), as this gives the widest sweet spot. As with many smaller monitors, you can get away with using them on their sides, which narrows the sweet spot to some degree, but you must ensure you arrange them symmetrically either with both tweeters facing outwards or with both facing inwards. There's a little practical advice on positioning in the concise handbook, including the sensible, but often ignored, recommendation that the tweeters be set at ear height and that nothing should obscure the sound from the speakers. Unlike most speaker ranges, the various ADAM models I've tested so far have had slightly different characters, at least as far as the low end and mid-range are concerned. The ones I liked most were the P33A and S3A dual-woofer models, as I felt these had the best overall tonal balance, but I have to admit that my initial impression of the P11As was similarly positive to the point where I had to do a double-take on the price. These really are superb little speakers, and the low end kicks like a mule. Best of all, the sound is tightly controlled and well focused, with very detailed, but nevertheless smooth, highs. You can get a lot of level out of them before the sound starts to get raggy around the edges, but if you have a bad mix, they'll be the first to let you know! They also seem to be fairly tolerant of the room acoustics, provided that you've made some effort in that direction. Listening to examples from my record collection highlighted the ability of these speakers to let you get inside a mix and hear all the separate elements, while the degree of focus they offer led me to re-evaluate some of my own recent mixes. Within their UK price range, these have to be very close to the top of the 'best buy' list, if not at the top of it. Well, I guess I don't need to tell you at this point in the review that I really enjoyed working with the P11As, and although I was expecting to hear the usual ADAM clarity and focus, I didn't expect the tight, extended bass end or the high SPLs these boxes are capable of. 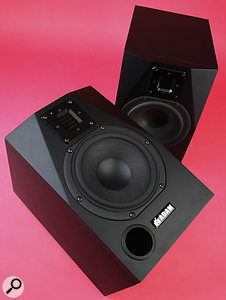 To my ears, these speakers are up there with the best of the ADAM range, but are priced to fit nicely into the budget of any discerning project-studio operator. Even if you already have a pair of monitors that you like working with, it may be worth considering the P11As as a secondary reference simply because they are so revealing. Hear them at your peril — you're unlikely to leave the shop without them! Well balanced sound with excellent clarity and focus. These are some of the best smaller active monitors I've heard in their price range, delivering both quality and quantity. They really do justice to the term 'studio monitor', but if you're turning out awful mixes, they won't let you down gently! £1116.25 per pair including VAT. Unity Audio +44 (0)1440 785843.